PNY and SanDisk have some pretty slick new offerings on the solid state drives front, inching us ever closer to the time when all new laptops will come with flash hard drives for faster, quieter and more efficient access. 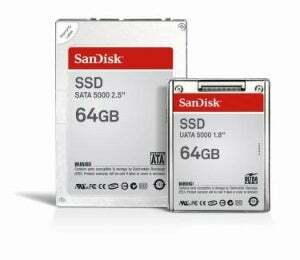 First, SanDisk announced their 1.8-inch 64GB UATA 5000 and 2.5-inch 64GB SATA 5000 SSDs. Not too shabby. Then PNY went ahead and busted out their 2.5-inch 128GB SSD, which is even better. Neither company has touched PQI's insane 256GB 2.5-inch SSD, but that thing is going to cost the price of a small island, so what we're really seeing at this point is a race to reasonable prices. With bigger SSDs coming out for less and less every day (although none of the above mentioned products have price tags as of yet), it's only a matter of months until we start seeing the transition to SSD laptops start in full effect. Get excited.